When it comes to choosing the right visual representation of your brand, trying to cram all that your brand is into one font or tiny symbol can be tricky. Three key things to consider in your logo design process are: who you are trying to reach, what feeling you wish to evoke, and how you can convey what your product or service does. Maybe your audience is young and trendy. In this case, you’ll want to choose a style they will appreciate. Maybe your audience is older, and in a more serious mood when thinking about purchasing the product you provide. Choose a color for your logo that either compliments or matches that mood so that you can meet them in their state of mind. Instead of being portrayed as something irrelevant and distracting, they are more likely to see your brand as credible. Ask yourself, what does your audience value? Do they value fun, excitement, and surprises? If so, you may want to choose a more whimsical design. Does your audience value brevity and straightforwardness? Choose a clear, no fuss design. However, be careful not to lose too much of your own brand personality and individuality in trying to cater to your audience. Choice of color and font for your logo that will play a big role in this. Psychology studies have proven that certain colors evoke specific emotions. Do some research to find out how the colors you choose might affect the consumer’s mood. Understanding the connotations of the colors you choose will help your brand to be recognizable and comprehendible. Fonts also communicate how your business will be perceived by others. The letter styling affects the voice of text, or the way it reads. If your brand is elegant, you will want to choose a font that matches that look. For example, Footlight MT or Comic Sans might not be your best options. However, if your brand was associated with children in some way, those would be great fonts. If you still aren’t sure, test drive your options. 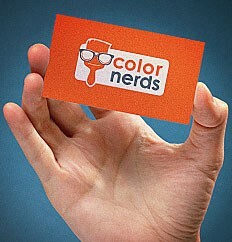 Choose a few fonts to have your logo printed in, and have your co-workers and friends share their first impressions. If the impressions are close to the message you want to convey, you know you’ve found your font. 3. Say What You Do. When designing a logo, it can be easy to get lost in trying to attract emotional attention from a specific audience, so much so that you forget to convey what it is you actually do. Or, worse, you accidentally misrepresent your product or service. Probably the simplest way to say what you do is with the use of a symbol. Different symbols have specific messages associated with them. Companies in the medical field often use crosses to represent healing or rescue. Companies in education use symbols like books or pencils. Whichever images, fonts, or colors you choose to represent your brand, be sure that you are prepared to use them for the long-term. You will be able to make small changes to update your logo every few years, but it will need to remain consistent so that it continues to be recognizable. After all, the purpose of the logo is to help your audience identify you.